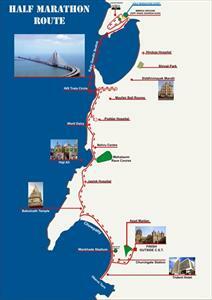 What is the route for the 2012 Mumbai Half Marathon? Will the 2012 Mumbai Marathon route include the Bandra Worli sealink? This article answers these queries by giving complete information on the running road routes for the 2012 Mumbai Marathon and also and provides a map of the event. The global marathon racing calendar has got India as one of the major events. Just 2 years ago, the Standard Chartered Mumbai Marathon received the tag of 'Silver Label Road Race' from the International Association of Athletics Federations (IAAF). Last year, this label went up a notch further and the 8th edition of the race got the highly rated Gold Label. Not surprising! After all, the event is being organised very well every year & international marathon runners are enthusiastically participating. The 9th edition is likely to see even more participants than last year, as the enthusiasm from locals and global marathon stars has considerably increased. Even the cash awards for the winners & runners-up have increased, making it a glittering attraction! The top placed overall finisher of the marathon in both men's and women's category will bag US$36,000, while those of the half marathon will get to win US$2,000. In addition, there are cash awards for the top finishers amongst Indian participants and in the events for veterans. Medals and certificates will also be given. The title sponsor is Standard Chartered Bank, and hence the event is known as the Standard Chartered Mumbai Marathon. The Associate Sponsor is Tata Consultancy Services and Procam International is promoting the event. Bollywood celebrity John Abraham is the event ambassador. Venue: Mumbai. The full marathon will begin and end outside CST railway station. The half marathon will begin at MMRDA grounds, and end outside CST station. Important Note: Due to the possibility of changes in the schedule and routes, participants are advised to check with the official website before the event.